When storing your boat in cold environments over long periods of time, it’s important to keep in mind several things. Besides preparation, which deserves an entire article in its own right, there are a plethora of boat storage options for essentially any budget and preference. The question becomes- what is your highest priority? The answer to that question will determine exactly how and where you decide to store your boat, and this article aims to make that decision as easy as possible for you. The options are simple, but the differences between them can be subtle. To put it at its simplest, you have indoor and outdoor storage. Indoor storage is more expensive, but safer and better for your boat in the long run. Outdoor storage is often cheaper, but puts your boat at a higher risk, and- if it’s stored at home- can be an eyesore. But options don’t stop there. Boat owners can choose from have rack-based storage, garage storage, and individual boat sheds. Your yard and driveway are the most convenient and cheapest options for winter boat storage. You can store them for very cheap, often free, and require no travel time to pick it up when you are ready to hit the water. However, the drawbacks are obvious- your boat will only be protected by the elements by a tarp or boat cover, and many consider this sort of storage to be unattractive. 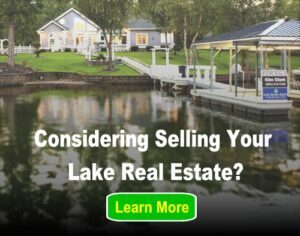 The other outdoor option is a boat lift on your dock. This will hoist your boat out of the water and suspend it in your dock or boat house, making it easy to access when the time comes to use the boat again. Many local marinas also offer boat slips for storage if you do not have a dock with a boat lift on your property. This is not as convenient as having your boat on your property, but is still as simple as driving to the local marina then popping your boat back into the water. With any of these options you will want to make sure to winterize your boat, or have a professional do it, to protect from freezing temperatures. 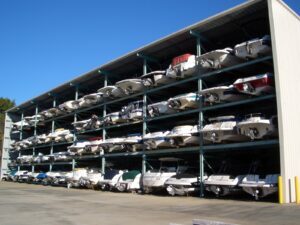 If you have a large enough garage, and space for all your vehicles, or don’t mind leaving a car outside, you can always store your boat right in your own house. This has the convenience of keeping your boat on your property, and if it is an attached garage, the heat from your home will help keep your boat from reaching sub-freezing temperatures. This is where things diverge, and get pricey. First, you can utilize indoor dry racks; they’re safer, but often more expensive than outdoor storage. These warehouse-like buildings store boats in racks, up to six high. If this is the option you choose, the process of retrieving your boat can be a bit of an inconvenience. The most expensive option is climate controlled, rented, indoor storage. While not available everywhere, these storage facilities, similar to a traditional storage unit, ensure that your boat will be secure and completely protected from the elements while not in use. While the list is fairly simple, it’s important to understand what options are available so you can make a well-informed decision when it comes time to put your boat up for cold weather. Keep in mind the aesthetic you want, your price range, and how important complete safety from the elements is to you when making the choice. Considering how big of an investment a boat is you really need to know how to properly store it when it is not in use. I particularly like that the article brings up that most marinas will have a place for you to store it during the winter. That way you can leave it in the care of professionals until you need it again in the Spring or Summer. I really liked your tip to use indoor storage for your boat if you are storing it over the winter months. My brother recently bought a boat and wants to find storage for it. I will be sure to mention this to him.